The Upside Of The Bitter Cold: It Kills Bugs That Kill Trees Scientists say that the freezing weather can help reduce the population of a beetle that harms trees, as well as other invasive species. In Minnesota, up to 80 percent of the beetle's larvae may die off, buying some time for those who feared its negative effects on the ash tree population. 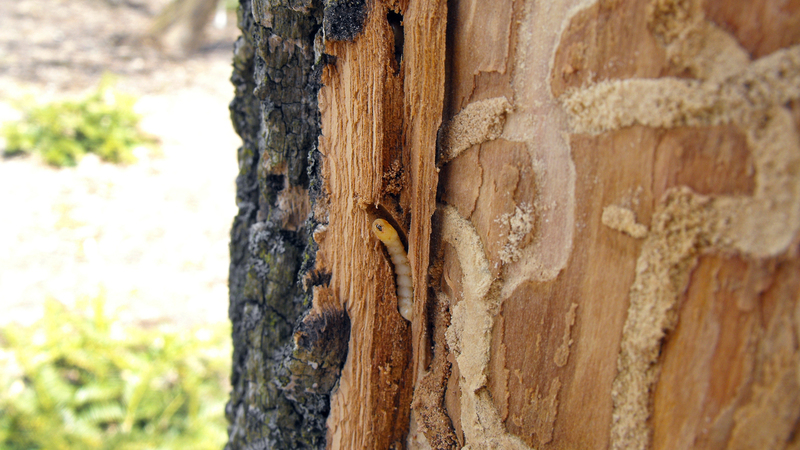 Emerald ash borer larvae damage the ash trees they live in. While many of us may prefer to never again see temperatures drop below zero like they did earlier this week across the country, the deep freeze is putting warm smiles on the faces of many entomologists. That's because it may have been cold enough in some areas to freeze and kill some damaging invasive species of insects, including the tree-killing emerald ash borer. After their eggs are laid in the bark of ash trees during late summer, the larvae of these beetles start to bore. They feed on the conductive tissue, where water and nutrients go up and down the tree. In infested trees with multiple larvae, the small, white, worm-like creatures about half an inch long eat their way through the tree tissue in a squiggly S-shape, cutting off what are essentially the tree's arteries and starving the tree branches above. Then, they burrow into the bark for the winter, where they are somewhat vulnerable to extreme cold. Chopping into an ash tree with a hatchet in his frigid bare hands, entomologist Tom Tiddens peels back the bark, looking for emerald ash borer larvae. Native ash trees make up 20 percent of the forested land at the Chicago Botanic Garden, where Tiddens is supervisor of plant health care. He wants to see how this tiny but devastating insect has been faring through this week's bitter cold snap that sent temperatures to 16 degrees below zero in the Botanical Garden. While many tree-lovers are hoping that all these beetles are freezing and dying off, "it turns out that that's not really the case," Tiddens says. "This insect, like a lot of other insects, actually has a strategy for over-wintering." The bugs do something called "supercooling" when temperatures first begin to plummet in the fall, he explains. "[The emerald ash borer] will cease feeding. It will stay under the bark so it's protected there. It will actually purge all the stomach contents of its gut because that could freeze," Tiddens says. "They actually fold themselves in half when they do that." Sure enough, many of the larvae he finds after chopping and peeling back the bark are doing just that to try to stay alive. But Tiddens and other experts say the invasive insect will die when temperatures get cold enough. 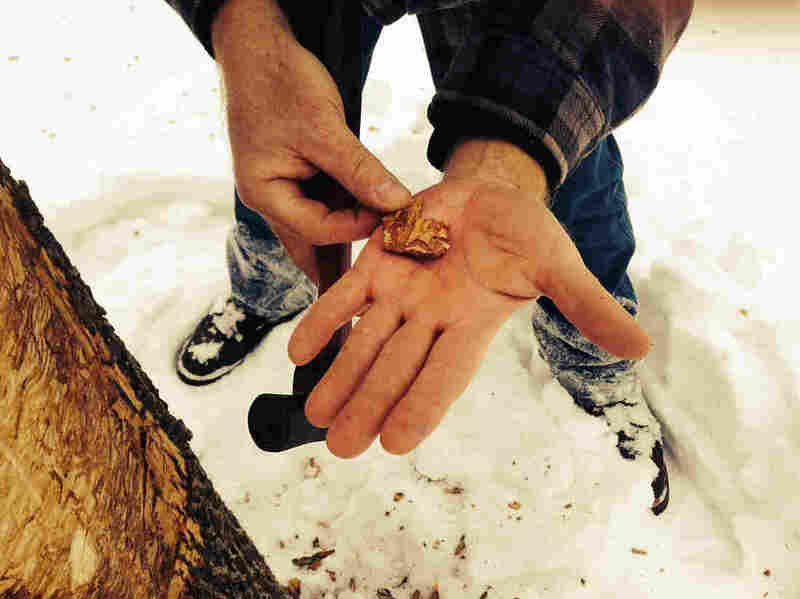 "There's no magic number in all of this," says Robert Venette, a research biologist with the U.S. Forest Service in Minnesota. "When temperatures fall to minus 20 to minus 30 degrees Fahrenheit, that's when things get interesting." At 20 below zero, as much as half the population can die off. At 30 below, nearly all of the pests are likely to die, he explains. Tom Tiddens, supervisor of plant health care at the Chicago Botanic Garden, displays bark with beetle larvae. It got cold enough in parts of Minnesota to possibly wipe out up to 80 percent of the emerald ash borer population and significantly slow the advance of the invasive insect there, Venette says. "I'm probably one of the few people that really roots for an extremely cold day because I really do think it helps with some of the major insect problems that we have," he says. The cold may reduce the population only by 10 to 20 percent in parts of Southern Wisconsin, Northern Illinois, Michigan, Indiana and Ohio, but Venette cautions that the cold is just a temporary setback for the beetles. "We're simply not having the cold weather that we've had in previous years. So we can't count on the cold as being the solution to the problem," he says. Venette and other experts say that this week's record-breaking cold might slow the spread of other invasive species, including the gypsy moth, which begin to freeze to death when temperatures fall to 17 below. Another troublesome invasive species set back by the cold is the wooly adelgid, which has infested and killed hundreds of thousands of hemlock trees in the Northeast. It begins dying when temperatures fall just a couple of degrees below zero. The population of some kinds of ticks, which have been advancing farther north than ever before, should be reduced by the bitter cold, too. At the same time, many of our native species are able to withstand the bitter cold quite well. Some species that spent the winter underground are protected by the blanket of heavy snow that had fallen in many northern areas of the country before the deep freeze set in. Greg Mueller, a biologist at the Chicago Botanic Garden, says that many beneficial insects, including pollinators such as honeybees, continue to thrive in the hive during extreme cold streaks. "They actually kind of cluster together and form a bee ball around the queen and then vibrate their wings and that keeps the whole nest up and warm in the 90s. And so it can be howling outside, [but] if they've got the protection, if their hive was well prepared, they're going to be just fine." If you're a gardener, tree-hugger, or just someone who wants to see flowers, trees, shrubs and crops thrive this spring, go ahead, join the entomologists in hoping for another, even colder, polar vortex to settle over the country this winter.